This group show at the Freedlands Foundation brought together four sculptors: Alice Channer, Angela de la Cruz, Holly Hendry and Jonathan Baldock. Angela de la Cruz’s precarious perched damaged elements that hint at the delicacy of human life. These are spare and elegant structures whose scale and components comfortably reference the human body. The tired stool and damaged chair stand in uneasy and precarious coexistence. Across the room, the smooth metal trough, crumpled and forced to fit into the filing cabinet stoically faces the viewer. Jonathan Baldock’s ceramic tower also hints at the fragility of life suggesting that the veneer containing our inner most feelings is in danger of rupturing. The wall hung pair of ceramic masks barely contains their hidden thoughts. The smooth surface of Holly Hendry’s jigsaw sculpture contrasts with the cracks between the assembled shapes and differing materiality of the various elements. The surface of each pieces is always smooth and the changes in depth leads the viewer to reconsider the structures depicted. The addition of the occasional found object adds a light touch of humour. Alice Channer showed two works in the exhibition. Her floor piece Bonez began its transformation as a garment. Through the lost wax casting technique, a stretch material maxi dress has become two elegant bronze floor pieces. The top surface carries the imprint of the weave, pleats and hems, leaving the viewer in no doubt about the origins of the work. Meanwhile the underside is smooth and reflective. The armholes call to mind the eye of a needle. The disembodied object brings to mind questions of sustainability and longevity which provide a conceptual link to Channer’s wall hung piece Soft Sediment Deformation, Full Body. Images of eroding sandstone is manipulated and digitally printed onto fabric. Pleating imposes another distortion and bring the fabric into the realm of sculpture. The title brings together both the source of the imagery and the body, alluding transformation, ageing and decay. All the pieces sat comfortably within the overall theme, each artist suggesting disjunction and deficiency through their work. The small but perfectly formed exhibition was a delight to visit, the works setting up interesting dialogues and I came away with many questions and some answers. Cul-de-sac is an exhibition of colourful contrasts. Humour is everywhere. The work is both monumental and elegant. A bundle of tall slim timbers stand proud in an alcove designed to hold the marble statue of a citizen of note as they welcome visitors walking up the stairs. Their tops wrapped in indeterminate material they are not overawed by their patrician surroundings. In the first room, the sculptures rise up to meet the light streaming into the galleries. Elegant fabric forms gather in the corner, their insubstantial though colourful shapes contrasting with their heavy cylindrical concrete bases. Everywhere the sculptures play with balance and angles. The unexpected planes suggest they may be on the edge of collapse and delicate uncertainty. Large smooth blocks are held high close to the ceilings on soaring stilts, their joints roughly wrapped in plastered scrim. The height and proportions create tension and precariousness. The fine stilts holding large blocks perilously aloft seem to defy gravity. What is heavy, what is weightless? As the title suggests, visitors are forced to retrace their steps to leave the gallery. They must leave by the only entrance. The return journey offers different views. Dense concrete slabs both on the ground and shaped as lintels held high above our heads slope at unlikely angles to lead the eye across the space. The angles are different offering new perspectives and making different connections. The visitors are rewarded with different relationships and new interplays. The gaggle of angled narrow poles effortlessly holding up the multi layered metal structure suggest they are frozen in the midst of a dance offering a strong contrast to the stolid column of solid grey across the room. Even if they are no longer salvaged directly from skips, materials are still modest and non-precious. This does nothing to diminish the refinement of works. The feel of the exhibition is of work by an artist at ease with her practice and with nothing to prove and rather enjoying working with scale and irreverent materials. This essay reviews the work undertaken and developed during the past few months of my Fine Art MA course. Research into the relevant critical theory will be referenced and alongside this the practice and writings of relevant artists will be examined and discussed in order to support the work. Paradoxically, exhibiting in the James Hockey gallery and the Lewisham Arthouse has crystallised my interest in making and showing work in a less formal manner than previously and this has also clarified my interest in less conventional or traditional spaces. Alongside this realisation, an interest in the element of not-knowing and in the fostering of an element of potentiality in the work is beginning to emerge. The scale of the work has changed. Both the finished pieces and the materials have increased in size. The fine wool, the linen and the flax yarns have been replaced by bailing twine and sisal rope. An iron cattle collar has replaced the small wooden screwdriver handle that fits comfortably in the palm. The change of scale is not in any way a search for monumentality but rather to draw out the references to people, to accentuate the allusion to what it is to be human. According to Henry Moore ‘There is a right physical size for every idea’ (quoted in George 2014:91). The search, through the use of these different materials which require more physical effort and the involvement of the whole body, is for a language to explore our relations as people to the world around us, to the place in which we negotiate our everyday lives. Protagoras, the Greek Philosopher, stated that ‘Man, not the universe, is the measure of all things’. The change of scale has allowed the work to allude more obviously to the body. The introduction of clothes rails in the work reinforces the allusion. The structure of the rails allows the elements of the work to hang within a well defined edge. The use of more than one rail enhances the opportunity of dialogue between the work and the space in which it exists. It should nonetheless be remembered that contrast in scale and the presence of small details and finer materials have the power to draw the viewer in. Several links to the recent development of the work can be found in this extract written by Ann Coxon in relation to women sculptors published in the book accompanying the textile exhibition shown at the Turner Contemporary in 2017.The materials and the working methods referred to by Coxon have a direct relevance to the making and construction of several of the most recent pieces of work. The materials have not only changed in scale, but also in nature. There has been a growing awareness of the questions which can be asked by the juxtaposition of different elements: the yielding nature of the thread against the hardness of the marble, the disarray of the tangled skein set against the tension of the taut line, the weight of metal anchoring a suspended paper structure. Does the meaning of the work, what Marcel Duchamp refers to as ‘the work of the work’, sit in the liminal space between the physical and the ephemeral? The texture of the materials invites the viewer to experience the work as a whole body experience. Merleau-Ponty asserts that we decipher our environment, the world we live in, our position in it, by using all our bodily senses. In contrast to the philosophical view that consciousness is the locus of this knowledge, Merleau-Ponty posits that we encounter the world through our bodies. Texture engages with memory. Though we may not be allowed to touch something, the act of looking alone can trigger our sense of touch by engaging our stored textural recollection and thus allowing the viewer to become more fully involved with the work. The tactility of the materials is part of the message. The texture of the materials from the smoothness of bone or the roughness of rope to the coldness of metal are triggers for our senses beyond mere sight. Through these sensations it is hoped to trigger a greater awareness of how we connect to the world around us and how we might lead more stable and grounded lives. In his theory of hyper-reality, Jean Baudrillard asserts that it is no longer possible, in post modern culture, to separate reality from representation. The real, the artificial and the copy are now indistinguishable. Only simulacrum remains. Not only do we live our lives through the filter of social media, but the function of places has become blurred. The work space can be an office, home, train, bus or even a coffee shop. How often do we photograph landmarks rather than look at them? The experience of being in a place has become subservient to the making of, often digital, memories. Earphones separate us from our environment and from the people around us. While we naturally engage with both existent communities as well as digital communities, the purpose behind these works is to celebrate the connections we have with the place and spaces in which we live. As a reaction to the new reality, my work uses physical objects to explore what it is to be human and our connection with the world in which we find ourselves. The use of materials such as bailing twine provides a clear link to agrarian communities and the land on which much of our livelihood still depends. The juxtaposition of antithetical materials such as the plastic twine and animal bones seek to emphasise the role of the human in the husbandry of the land and our place in the world among animal and plants. Most of the elements in the work are made of mundane matter and carry none of the value associated with precious materials. The reference is not to monetary value but rather to the value of manual labour and of having the skills required to forge an embodied life. The use of found and gathered objects in the work offer a visible link to history and of creating a concrete connection to craftsmen in a past we cannot know. Well made tools were treasured and the marks of time they carry should be read as a badge of honour, a testament to the skills of previous owners, bringing to mind William Morris’s vision to create meaningful everyday possessions. The survival of these tools and artefacts attest to the authority vested in the objects. These are representations of skills we may be in danger of losing. The knot securing the animal skull is reminiscent of a noose. The brutal allusion is intended to encourage the viewer to confront our mortality and to act as a reminder that all life is transient and is something to be appreciated and treasured. The intention is to develop the practice with a focus on curation and the way forward is likely to include making and showing work in places outside of or away from traditional gallery spaces. The standard white box offers a passive environment in order to focus attention on the art works themselves. The conversation between object, site and meaning is a multi-layered one. The location adjacent to a sculpture inevitably brings with it its own memories and associations. The viewer too will read the site according to his or her history. An outdoor site is less controlled than an indoor one and is likely at the very least to be subject to variations in the weather. To disseminate the work in non-standard situations is to invite the possibilities for more spontaneous and for less formal and more casual engagements with viewers in unexpected circumstances. The dismantling of Land Line on the Surrey Heathland was paradoxically more interactive that setting up. This may of course have been pure chance or, with several weeks between setting up and taking down, a function of the seasons and weather conditions. The Apopoclectic show by MA students in the James Hockey gallery allowed works to breathe and inhabit their own space. The generous gallery space encouraged the display of work in a manner which encouraged thinking about how the curation affected the message. As we experience works relative to our bodies, the placement of elements high on the wall or low on the ground will require some effort of the part of the viewer. Our field of vision will require us to stretch our gaze upwards and to lower our gaze, perhaps bending over slightly to look at elements placed on the ground. The absence of a plinth removes a formal element and allows vernacular presentation, more suited to the message. The act of weaving in the gallery while the show was open was a new departure. The act of spending time with the work was reminiscent of Anthony Key’s explanation of his profound need to put something of himself into the work by spending time making it. When showing work in a gallery space, plans will include continuing to make the work in the space for the duration of the show and also encourage visitor participation. At Lewisham Arthouse, the position of the rails in the space was in response to the large windows, a striking architectural feature of the room. In addition, the placing of the rails in relation to each other enabled visitors to walk between and be within the work if they so wished. Not quite knowing what something is seems a pretty good reason for repeating the gesture. And part of its transformation from the stuff of the studio to possible work in itself was to make another glass case and then another. To repeat was paradoxically, a way to make it her own and put her stamp on it. Making several versions of a work was her normal way of working. One of the many examples of this process begins with Sol LeWitt’s acquisition of a glass case, formerly a pastry display case, in which he kept six of Hesse’s Studioworks. Hesse adopted this idea and went on to make several versions. Not only did the cases themselves evolve as she made each one, but the contents and the manner in which she displayed the contents also changed. The process of making, of arranging, of curating, of work evolving through various iterations is key here. Experimenting with different configurations has been a feature of the development of the work in the run up to the exhibition at Lewisham Arthouse. Not only is it about the process of making, but also about the process of thinking alongside the making and ultimately of recognising what you are looking at. The act of working through an idea with no fixed goal in sight keeps possibilities open. The open ended process embraces chance and fortuity. To postpone the arrival to a completed piece brings the opportunity to examine the process and to arrive at a degree of clarity about the intention along the way. Through the introduction of an additional material or an unlikely object, the dynamic of the arrangement will shift. Jane Bennett posits that the body is composed of ‘a vital materiality’ that is able to think, to know and even to feel to a much greater degree than we can bring to consciousness. Bennett proposes that all matter has limits and inherent possibilities and that our bodies together with the materials with which we are working are participants in producing the final form. Material intelligence emerges from the interplay between our bodies and the media used in making work. Bennett describes assemblages as ‘ad hoc groupings of diverse elements, of vibrant materials of all sorts’ (Bennett 2010:23). Jane Bennett posits that an assemblage is more than the sum of its parts. The interaction between the various materials and elements produce something entirely new. She also proposes that the competence of the materials are not equal, some will affect and be affected to a different degree. Each material has its own characteristics. Many of the materials in the current assemblage are flexible and malleable. They bring to mind Robert Morris’s industrial felt cut into strips. The nature of the thick felt in combination with the slits allows for the potential that the work might take on a different shape every time it was re-installed. The latter may include the use of rules and elements of chance thus incorporating an element of not-knowing and of possibilities as yet unknown through an element of game playing. 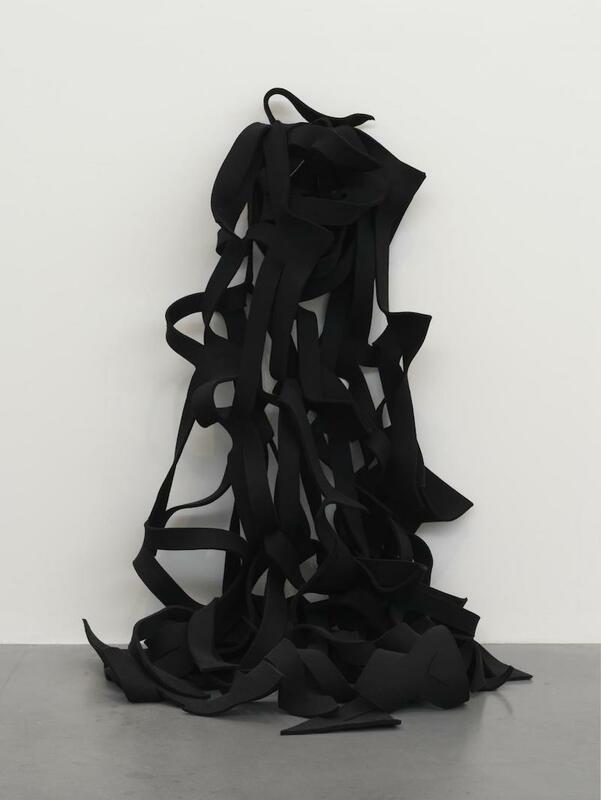 Robert Morris embraced the element of chance when working with cutting industrial felt into strips and allowing the work to take on different shapes each time it was rehung. The potentiality of different configurations exists in Hermeneutics because of the nature of the malleable materials, the process of making and ultimately the resulting forms. This is an exciting and promising venture which opens up unexpected possibilities. Additional uncertainty accompanies the introduction of materials with little history. Another way in which the work might be randomly reconfigured would be to invite visitors to move elements of a piece of work. This could happen by leaving the choice to the gallery visitor or for the move to be subject to the throw of a die or to predetermined rules to be chosen at random by the visitor. By seeking out materials which have little or no appeal, rather than those which do, the element of not-knowing has been thrown wide open. To collect material which has no intrinsic appeal is a new departure and one to be welcomed in so far as it offers new possibilities. The element of not-knowing is likely to be more pronounced as time will have to be spent in growing to discover and exploit the characteristics of these new materials. The vacuum cleaner pipe is light, flexible and hollow. This offers many possibilities which goes some way to make up for its initial unprepossessing appearance. This latest module has been a time for change and progression. The scale of the work has increased. This, together with a scaling up of materials used, has allowed for greater somatic involvement in the making process. Placing of the work within the exhibiting space is to be given greater consideration whenever possible. The materials themselves have become less homogeneous. The engagement with tools continues but the addition of potentially uninviting or startling objects demands a greater degree of openness in order to integrate them successfully into the work. This new departure is full of potential. Plans will be made to consider curation and to find spaces beyond traditional galleries in which to make and show work. In conversation: Anthony Key (artist) and Katie Hill (Sotheby’s Institute of Art, London) 24 November 2018.